I don't really wish the wooden, blank, non-talented stripper any actual ill, but seeing his character meet a most unhappy end elevates G.I. Joe: Retaliation to a much better film. Sadly, I never saw the body, the rotting corpse, so that took a bit of the joy away for me. Channing Tatum's Duke was never intended to be a big part of Retaliation, but after the wild success of Magic Mike, 21 Jump Street, and The Vow all made people think he was a star (he certainly has never been an actual actor...can't wait to see Channing Tatum as George in a remake of Who's Afraid of Virginia Woolf?). That, along with a desire for more 3-D (sadly, not for more cowbell) pushed Retaliation's release. One thing that perhaps should have pushed the released date, the concept of an actual story, was, given the final product, not on the agenda. G.I. Joe: Retaliation, to its own shock I suppose, is better than its prequel The Rise of Cobra, but I think that has to do with the fact that Retaliation knew it was pretty much junk so it didn't even bother. 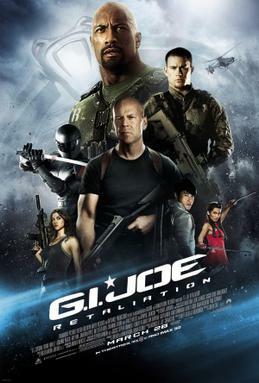 The Joes (a group of elite military operatives) have made a daring raid in North Korea. After some R&R with Duke, his friend and co-Joe Roadblock (Dwayne Johnson) again take to the field, along with Flint (J.D. Cotrona) and Lady Jaye (Adrianne Palicki). However, evil is afoot: Cobra, still masquerading as The President (Jonathan Pryce), launches an attack on the Joes and frame them for stealing warheads. 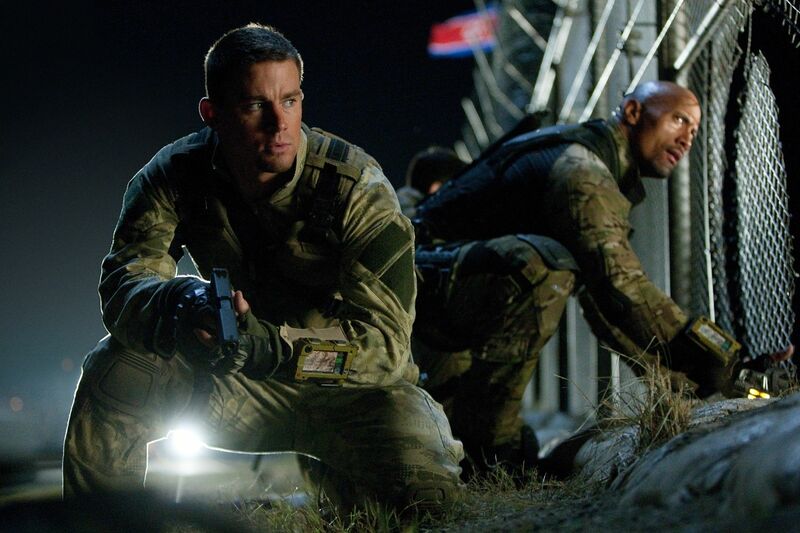 All the Joes are killed (CHANNING TATUM DIES!) but Roadblock, Flint, and Lady Jaye all survive. Now it's up to them to avenge their friends, clear their names, and stop Cobra from taking over the world. For this, they need to go to the original G.I. Joe, General Joseph Colton (Bruce Willis). Also brought along is Snake Eyes (Ray Park), who with his apprentice Jinx (Elodie Yung), take Storm Shadow (Byung-hun Lee), who works with Cobra and has yet to answer for the murder of Snake & Storm's master. The Blind Master (RZA) helps them discover that Cobra deceived Storm Shadow into killing the Grand Master, and Storm Shadow joins the attempt to stop Cobra. Cobra's plan is to destroy all nuclear weapons by threatening the world's nuclear powers with annihilation, and when they blink Cobra has the only nuclear arsenal. Frankly, in a movie like Retaliation, plot is irrelevant. It presumes a.) that you've seen Rise of Cobra, and b.) you care about the 'twists' (such as the revelation of the truth over the Grand Master's murder. It's a lot of noise and action, which I guess is what you're looking for you could do worse. However, even the action that is suppose to be thrilling (such as the mountain fight) is rather boring. I didn't care. That is what I found Retaliation's real crime: I didn't care. I didn't care about the characters (I didn't know enough of them to develop any interest), I didn't care about the situations (because the stakes never felt high), I didn't care about anything in Retaliation. I guess it was like watching a video game, like the one Duke and Roadblock were playing. Since I didn't know the characters, I figured the performances en masse weren't interesting or believable. As I watched and finished G.I. Joe: Retaliation, a constant note on my page is 'why should I care about any of them or it?' It's a boring movie with nothing really worth recommending it. Except for the fact that CHANNING TATUM DIES! That, if nothing else, is what saves the film from being total mediocrity.